Christopher Richard "Rick" Stein, CBE (born 4 January 1947) is an English celebrity chef, restaurateur and television presenter. Along with business partner Jill Stein he has run the Stein hotel and restaurant business in the UK for over forty years. With a number of renowned restaurants, shops and hotels in Padstow along with other restaurants in Marlborough, Winchester and Barnes. He is also the head chef and a co-owner of "Rick Stein at Bannisters" at Mollymook, Rick Stein at Bannisters, Port Stephens with his second wife Sarah Stein Australia, He has written cookery books and presented television programmes. Of German descent, Christopher Richard Stein was born on 4 January 1947 in Churchill, Oxfordshire, to Eric and Dorothy Stein. Stein was educated at Wells Court, a preparatory school just outside Tewkesbury, then Wells House, the Court's bigger sister-school at Malvern Wells, and then Uppingham School. He took A-levels in English, history and geography, but failed all of them. He moved to a cram school in Brighton, gaining E grades in English and history. Stein partially completed a hotel management traineeship with British Transport Hotels at its Great Western Royal Hotel in Paddington. He worked there as a chef for six months. Distraught by his father's suicide, at age 19 he went to Australia, where he worked as a labourer in an abattoir and as a clerk in a naval dockyard. He travelled to New Zealand and Mexico around that time to "take some time out". Being on his own, he read widely, reflected on his attitude to education, and applied successfully to New College, Oxford; where he earned an English degree in 1971. Shortly after that, he moved to Padstow. After graduating, he converted a mobile disco in Padstow, which he had run as a student, into a quayside nightclub with his friend, Johnny. It became known for its freeze-dried curries. However, the nightclub lost its licence and was closed down by the police, mainly due to frequent brawls with local fishermen. The pair still had a licence for a restaurant in another part of the building, so they continued with that to avert bankruptcy. Stein ran the kitchen using the experience he had gained as a commis chef. Eventually he converted it into a small harbour-side bistro, "The Seafood Restaurant", with his wife Jill in 1975. As of 2015, his business operates four restaurants, a bistro, a café, a seafood delicatessen, a pâtisserie shop, a gift shop and a cookery school. In 2007 threats against Stein's businesses were made by Cornish nationalists. His impact on the economy of Padstow is such that it has been nicknamed "Padstein". In 2009 Stein made his first acquisition in the nearby village of St Merryn, 3½ miles from Padstow, taking over the Cornish Arms public house on the village's outskirts, intending to keep it as a traditional Cornish pub. In October 2009, Stein and his fiancée, the publicist Sarah Burns, opened "Rick Stein at Bannisters" in Mollymook, Australia. Stein said at the time of opening, "Ever since a memorable weekend eating Pambula oysters and flathead in Merimbula in the sixties, I've had the image of the clean blue sea and sweet seafood of the South Coast fixed in my head so when I was introduced to Mollymook about six years ago I knew that one day I would open up a restaurant celebrating local fish and shellfish but keeping it really simple." In 2018 Rick Stein opened up a second “Rick Stein at Bannisters” in Salamander Bay, Port Stephens with his wife Sarah Stein . Stein has become a popular television presenter on food programmes. After appearing once as guest chef in Keith Floyd's 1985 series Floyd on Fish and in his 1986 series Floyd on Food, he was offered the chance to present his own series – like the "travelogue" style of cookery show pioneered by Floyd – on BBC television, using Floyd's producer and director David Pritchard. This was to cause some rivalry, even feud, only resolved shortly before Floyd's death. His shows have included Rick Stein's Taste of the Sea, Fruits of the Sea, Seafood Odyssey, Fresh Food, Seafood Lovers' Guide, Food Heroes, French Odyssey, Mediterranean Escapes, Far Eastern Odyssey, Rick Stein's Spain and Rick Stein's India. In the last five series, he set out in search of the best in the region's foods. Until 2007, Stein was often accompanied by his Jack Russell terrier, Chalky. Much of Stein's television work has been released on VHS tape or DVD, but the BBC have yet to release some of the early pioneering series. Since late 2018, however, much has been licensed to the UKTV Good Food cable TV channel, where it has been broadcast with some heavy editing (and therefore omitting up to 20% of the original broadcast footage) to allow for the inclusion of adverts. A book has accompanied each series, and his book English Seafood Cookery won the Glenfiddich Award for Food Book of the Year in 1989. Stein was awarded the OBE in the 2003 New Year Honours for services to tourism in Cornwall and the CBE in the 2018 New Year Honours for services to the economy. Stein met his first wife Jill over forty years ago in Padstow where they set up a restaurant and hotel business, he has three sons with Jill; Edward, Jack and Charles who are all key members of the team and Cornwall is the cornerstone of their successful family business. Stein now lives in West London with his wife Sarah Stein and his stepchildren. He met her in Australia in 1997, when she was working for Australia Gourmet Traveller. They married on 7 October 2011. When Stein was 18 his father committed suicide by jumping off a Cornish cliff, after suffering from bipolar disorder. Stein has a brother, John, and a sister, Henrietta. He also has a half-brother, Jeremy, his mother's son from her first marriage. He is also the uncle of DJ and music producer Judge Jules. Stein is Patron of the charities Padstow Youth Project, South West PESCA (Duchy Fish Quota Co.), the National Mission for Deep Sea Fishermen, the National Coastwatch Institution, the Dyslexia Research Trust and The National Trust. Rick Stein's Food Heroes Christmas Special, BBC TV December 2005. 2 half hour episodes, also aired as a 1 hour programme. On 16 February 2009 Stein was featured in an episode of the BBC's Who Do You Think You Are? genealogy documentary series. In 2012, Stein was among the British cultural icons selected by pop artist Sir Peter Blake to appear in a new version of his most famous artwork – the Beatles' Sgt. Pepper's Lonely Hearts Club Band album cover – to celebrate the British cultural figures of the last six decades. ^ "Rick Stein". dunedinlibraries.govt.nz. Retrieved 4 January 2017. ^ "Rick Stein signs books in city". Oxford Mail. 23 July 2011. ^ Sale, Jonathan (2 November 2000). "An Education in the Life of Rick Stein, Master Chef". The Independent. London. ^ Stein, Rick (31 May 2015). "Rick Stein - A Life Through Food". The Food Programme (Interview). Interviewed by Sheila Dillon. Bristol: Anne-Marie Bullock. Retrieved 25 January 2018. ^ "Caterer and Hotelkeeper 100: Rick Stein, the Seafood Restaurant". Caterer and Hotelkeeper. 6 December 2012. ^ a b "Rick Stein - Celebrity Angels". Retrieved 28 July 2016. ^ "The Seafood Restaurant". Retrieved 5 December 2016. ^ "BBC Lifestyle". Archived from the original on 26 April 2012. Retrieved 28 July 2016. ^ Low Orbit Helium Assisted Navigator; Lohan; Iss; Nasa; Google; purity, Brexit threatens Cornish pasty's racial; home, Grim-faced 'naut Malenchenko prepares to return; $1m+, One entire US spook base: Yours for. "Cornish separatists menace Jamie Oliver". Retrieved 28 July 2016. ^ Gerard, Jasper (14 January 2009). 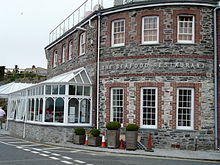 "Rick Stein's Seafood Restaurant in Padstow". The Daily Telegraph. London. Retrieved 2 September 2017. ^ "Rick's food empire reels in village pub". 11 April 2009. Archived from the original on 5 May 2013. Retrieved 28 July 2016. ^ "BBC Shop US & Canada - DVDs, Blu-rays & Best of British TV". Retrieved 28 July 2016. ^ "Celebrity chef Stein's dog dies". BBC News. 16 January 2007. Retrieved 1 August 2012. ^ "Rick awarded CBE in New Year's Honours List". Rick Stein. 26 June 2018. ^ Adams, Tim (19 April 2015). "The Stein family saga: 40 years of the Seafood Restaurant" – via www.theguardian.com. ^ "Find out about Rick Stein restaurants and more". Retrieved 28 July 2016. ^ Singer, Melissa (9 October 2011). "Celebrity chef Stein walks down the aisle in relaxed Aussie style". The Sydney Morning Herald. Retrieved 29 August 2018. ^ "Rick Stein". Who Do You Think You Are?. Series 6. Episode 3. 16 February 2009. 03:18 minutes in. BBC. ... when he committed suicide here on this coast. ^ a b "New Stories: Rick Stein". Who Do You Think You Are?. BBC. Retrieved 29 August 2018. ^ Holt, Laura (10 February 2012). "My Life in Travel: Judge Jules, DJ and music producer". independent.co.uk. Retrieved 21 July 2017. ^ "View the full CatererSearch 100". The Caterer. 11 May 2005. Retrieved 21 August 2016. ^ "New faces on Sgt Pepper album cover for artist Peter Blake's 80th birthday". The Guardian. 27 March 2016. Wikimedia Commons has media related to Rick Stein. Interview with Rick Stein – RadioLIVE New Zealand, June 2010.